I know, I know, my daily blog has turned into more of a monthly blog. Hey, a blind guy has got to get paid to. I now write regularly for The Dog Whisperer, so please do visit http://www.cesarsway.com and just do a search for my name Brian Fischler, and you can pull up all of my articles there where I write all kinds of articles including a column about going through Guide Dog School for the first time, and Celebs and Their Biggest Fan, a column about what else celebs and their dogs. Interviews that have been published have been with Jenna Elfman, Denise Richards, Joe Pantoliano, Gabrielle Anwar, Kearran Giovanni, Henry Winkler, and Callie Thorne with many more soon. Be careful what you tell your dog. On Monday, I kept telling Nash that we had an exciting day planned for Tuesday. I went to bed Monday night early for me at about 130, and at 450AM, I was awaken by Nash shaking himself awake. This never happens, so considering that we had an eventful day planned for Tuesday, I wasn’t thrilled, but what are you going to do. When you tell a smart dog like Nash that he has an exciting day ahead, he is going to get up at the crack of dawn all ready to go. Needless to say, we drank a lot of coffee, or should I say, I drank a lot of coffee, Nash doesn’t need the pick me up. We headed to Grand Central station at 10am to take the Hudson line to Yorktown Heights where Guiding Eyes For the Blind is located. I have gotten pretty good at navigating Grand Central Station since I have given into the realization that I have to ask for help to find my way around. It was very uneventful getting to our train except for Nash trying to eat something off the floor of Grand Central. Yuck buddy. Along with taking Nash to Guiding Eyes for a spa day, I had a real fun day planned, as I had to go to the DMV to get my ID renewed. I can understand why a driver’s license expires, not sure why an ID card expires. Did I stop being me all of the sudden? My Aunt Lona was meeting us at the train and she was kind enough to meet us on the platform, as the platform at Croton Harmon is so narrow that a sighted person has to be careful not to fall off it. My Aunt, Nash, and I headed out to lunch before going to Guiding Eyes. My Aunt told me when we were sitting there she went to say hi to Nash, and that Nash looked at her, then looked at me as if to ask is it ok? Pretty amazing considering my Aunt is someone that Nash knows pretty well. We had a very nice lunch, and then headed off to Guiding Eyes. We hadn’t been to Guiding Eyes in quite awhile, and I have to admit, I kept thinking is Nash going to think hey wait a minute why am I back here, and where did Brian go? Yes, I over analyze things. It isn’t very often that Nash and I are apart, so being apart and Nash being at Guiding Eyes, I had to wonder if he thought he was being returned? Nash was there to get a bath and his nails clipped, a doggy spa day. My Aunt and I didn’t have the same fun planned, as while Nash went into for his treatment, we headed off to the DMV. Amazingly, we got in and out of the DMV in about 30 minutes, and yeah, being blind and standing there with a cane, I had to say, “I’m here to get my drivers license.” I’m sure they never heard that one before! That was the extent of excitement at the DMV. We needed to go shopping, but we went back to Guiding Eyes before going shopping, as I was feeling a little guilty about leaving Nash there. I had let Susan the woman who trained Nash know that we would be there, so if she had time, I know Nash would love to see her, and vice versa. When we got back to GEB, Susan was already there with Nash, so I know the guy had to be happy to see a friendly face, but I think he was much happier to see me when I walked through the door. I got a little talking to as Nash does need to lose weight, and yes, we are working on it. It has been a really tough year living in the boonies, and not having anywhere to go. Susan got to play with Nash for a little bit, and we plan to go back in February, as I want to show GEB that Nash has taken the weight off, and he will be do for another spa day, as it had been much to long. We headed off to the mall, as I needed a new winter coat. It occured to me that my main winter coat was now 13 years old, that’s in human years, and it might be time to retire it. My parents wanted to get me a new coat and snow boots for Chanukah, and when you’re blind it’s really best to shop with someone who can see. Not that I wouldn’t look fantastic in a pink polka dotted winter get up! I was expecting the mall to be a zoo a week before Christmas, but amazingly, it wasn’t that crowded at all. We were at the mall that Nash and I trained in when we were at Guiding Eyes. It was so empty, I’m not sure how all those stores stay in business, so navigating the mall with my Aunt and Nash was very easy. After going through a few stores we finally found a great jacket and then winter boots. Living out in the boonies, if it snows or storms real bad, I will need the boots. Funny thing is I have never owned a pair of winter boots, as I never needed them. Wow, those things aren’t fun putting on and taking off. Maybe when I have to wear them, I can get Nash to help tug them off. My Aunt was so nice to make some food for me to take home with me, so after stopping by her house, it was back to Queens. It was so nice of her to drive us home, as taking the train and then having to rely on Access A Ride to get all the way home can be a nightmare, and an all day event. Overall, it was a very nice day, and there really isn’t anything better than having a nice clean smooth doggy sleeping in your bed. Down Goes Frazier, I Mean Down Goes Fischler! Yesterday Nash and I headed to downtown Manhattan. And when I say downtown, I mean all the way downtown, Fulton street which as you can imagine is quite a hike from the middle of nowhere Queens. We were making great time, as we had to take the Q46 bus from home to just get to the subway, than we took the E Train all the way to West 4th street to the A train, and what is funny when I lived in midtown West I would never do even one transfer, as I would find another way to get where I was going, now I am doing two transfers. At this point, I would like to mention the NYC MTA. I think it is great that they now make announcements that if you see something, say something. Of course, not sure how that applies to a blind dude. I also think it is great that the buses announce, “Please use the back door to exit” but really, can the buses please at least announce what stop you are arriving at? No one even listens to the announcement to use the back exit, so it obviously isn’t helping anyone. If you announce what stop the bus is arriving at, you are at least helping the blind, and probably the non New Yorkers. Also MTA, on the subway if you could add an advisory to have all your riders shower regularly, it would make taking the subway more pleasant. WOW, have I smelled some funky people on the subway recently. I guess my sense of smell as a blind dude is starting to heighten more. Oh boy, that is coming in so useful on the subway and smelling the stink of people. Anyway, we made pretty good time down to Fulton Street. We got off the train, and actually went out the right exit. Nash and I were pretty happy as it wasn’t raining, and it was a really nice day out, we were moving pretty quickly down Fulton Street, and then WHACK! OUCH, and a lot of expletives as I hit the ground!Nash walked me face first in to a pole. I felt like George Foreman had punched me in the face. I must have hit if pretty hard, as my face began throbbing immediately. Immediately, people rushed over to me. Fortunately, one guy had some napkins and handed them to me as the blood was flowing from my nose. I thought I had lost my front two teeth. Fortunately, my mouth was just throbbing so much, and was cut, as than I thought they were loose. I was really stunned, as I had never walked in to anything like this before. So glad that there is a first time for everything. I laid on the ground for a couple of minutes, and then some people helped me to my feet. I was dazed, as I asked them what that was, and it ends up it was a pipe of some kind sticking all the way out in to the middle of the side walk from a building. Yes, Nash did get yelled out a little, but not to much. I knew it wasn’t his fault, as the pipe had to be out of his sight line, but it is only human nature to be really angry and upset. Of course later, I felt really bad about yelling at Nash, as he did nothing wrong. It’s not his fault that he isn’t six feet tall, so he could see everything in my sight line. I would love to hear from any guide dog raisers, trainers, or handlers, what they think I should do about something like this in the future? Is there no way for a blind guy to avoid something like this? I am luncky that I didn’t break anything, lose an eye, or any teeth. Of course, I had a throbbing headache for the rest of the evening, and today, my nose is twice the size it normally is, and my mouth is cut. I can’t afford anything to happen to my Brad Pitt looks. And today I probably look like Brad Pitt from Fight Club. HA. I also wanted to give a shout out to all the puppy raisers from Guiding Eyes For the Blind that I saw last night. Always great to chat with you guys, and I am always so thankful for the hard dedicated work that you guys do. I am blown away by your youngest puppy raisers ever. WOW. You guys are the most dedicated people I have ever met, and without your services I would still be stuck with a cane! In January Nash and I headed out so San Diego. It had been years since I had been to San Diego, and Nash had never been there. We headed there to film a short film, VisionZone – You’re Not Alone Anymore. I had not acted in about a decade, and unfortunately for Nash, I was playing a character that had more vision that I really do, so no screen time for the Nash. I quickly learned that I was a second take or even thrid take actor, as it would normally take me a few takes to get the scene right and where I was happy with it. We had a blast making the film, and the Director Drew Antzis was a blast to work with along with the entire crew. I really enjoyed getting to act again, and quickly recalled how difficult a craft acting really is. I still wouldn’t call myself an actor, but I hope to get to do some more in the future. Come on Hollyweird, write more blind character’s and request that a real blind person play those character’s. After filming Visionzone, Andre Hardy, Kelly Stewart, and I headed up to L.A. to meet with the Melrose Improv to begin discussing Laugh For Sight expanding to L.A. in potentially November. Yes, it took 11 months to make it all happen. These things don’t happen over night. Nash and I ended up staying a few more days in L.A. at my friend Steve’s pad in Hollywood, and Nash got to meet his Uncle Steve and his Uncle Scott. Who knew that Nash would get to spend so much time with his Uncle’s in 2010! February brought us birthday month, as mine is the 2nd, my Mom’s is the sixth, my good friend Greg is the 14th, and my Dad’s is the 24th. Thank God we are not big gift givers, or I would have been broke for the year. My cousins and sister wanted to take me out for dinner out where my sister lives in Livingston, NJ. So Nash and I began the fun trek, meeting my cousin Erica at Penn Station, then getting on a bus to meet my cousin Jessica at her boyfriend Matt’s apartment in Jersey City, as he was lending us his car to head down to my sister’s. As soon as I heard Matt giving Erica all the instructions on what she needed to do to get his car to run, I said, “are you shitting me, this thing is a death trap.” Not to self, in the future, keep your mouth shut. We made it about ten miles on the Jersey Turnpike, and then of course the car died. So I ended up getting to spend my birthday in ten degree weather broken down on the Jersey Turnpike. Hey girls, if you want to take me out for dinner for my birthday in 2011, I have plans. In March, we headed down to Florida to see the parents in Lake Worth, as it had been a few years since I had been down there, and Nash had never been to Florida. Nash really loved being at his Grandparents house, as he normally does not have that much space to roam around. He was really good, not going into rooms that he wasn’t supposed to. I also think he really enjoyed having the option to do his business on the pavement or in grass. A pooch has to have options. Nash met a bunch of my parents friends and friends that I grew up with, and of course he was a big hit, and while we were doing a show at the New York Comedy Club in Boca Raton, we ran into the PR Manager for The Ritz-Carlton, South Beach, and we began discussuing a Laugh For Sight South Beach. From Florida, we headed back to San Diego for the Premiere of VisionZone. Optelec put on a great big party for the release of the film, and of course Nash and I were the center of attention. Hey, one of us was the star of the film. My buddy Scott came down to San Diego for the premiere, and after a night of fun, we headed back up to L.A. Nash was excited to be back at his Uncle Steve’s. As Steve has a ten foot sofa that he lets Nash sleep on. We were in L.A. for a few days and some shows, and we had to head back to San Diego to meet with the Optelec team to discuss their involvement with the future of Laugh For Sight and the expansion to L.A. We had a real nice dinner, and I got some shrimp tacos which I due love, and we were now on our way to Laugh For Sight L.A. actually happening. Afer San Diego we headed back to L.A. for a few more shows. Wow this was a busy month, I couldn’t imagine the year getting any busier than this! 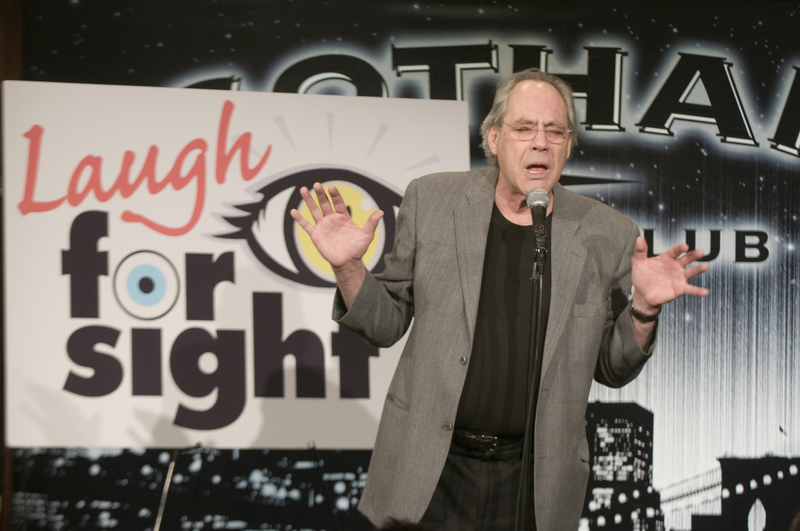 April was a month spent in NYC and beginning to plan for Laugh For Sight 5 to again be held at Gotham Comedy Club, but this year, it would be in September to allow for the expansion to L.A. in November. 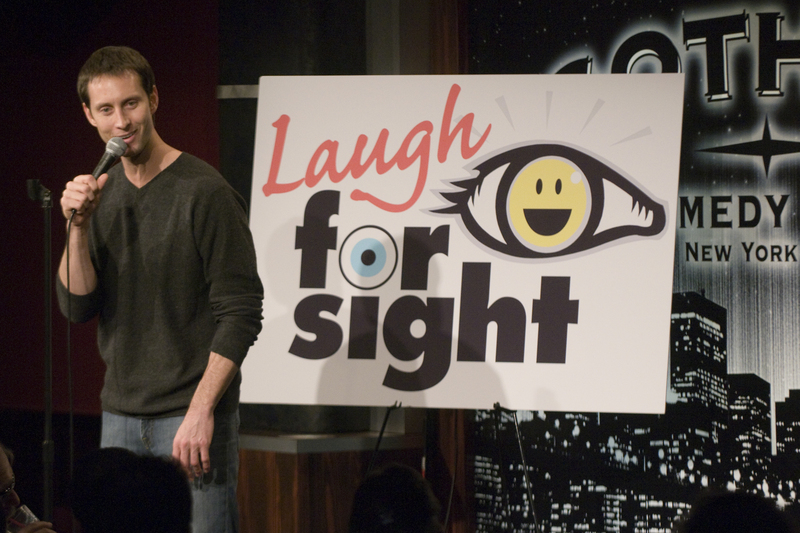 We set Laugh For Sight 5 for Sept. 20th and tentatively set LFS L.A. for Nov. 9th, We really had a lot on our plate, having to produce two Laugh For Sight benefits. It should be an interesting summer. In mid-May we got a most interesting phone call. I was being asked had I ever heard of a TV Show, Top Gear? No, I hadn’t. They then explained the show and told me they were working on a project where they wanted to see if they could teach a blind guy to drive and drift! Sounds interesting, and I was quickly in. So Nash and I were headed back out to L.A. We headed about an hour north of L.A. to a race track, and it was explained to me what they wanted me to do. Uh oh, what did I get myself into. More importantly, what did I get Nash into. My friend and brilliant comedian Adam Ferrara was the host of the new Top Gear USA, and I was introduced to Rutledge Wood, and then finally to Tanner Foust who would have the interesting task of teaching me how to drive a stick and drift. Nash got lucky as he was only in the car while I was learning how to drive stick and was going very slowly around the track. For all the stunts, the burnout, the doughnuts, and emergency brake parking, Nash was a spectator on the side lines. I was fine with almost everything, as it was a blast driving again, and getting to learn how to do things with the Nissan 370z that most people could only dream of. The doughnuts did make me almost throw up, and put a good scare into me, as I had no clue if we were heading straight at something. After my day of driving, it was back to L.A. for Nash and me and to Uncle Steve’s. We spent a few more days in L.A., had some shows, and began laying the ground work for Laugh For Sight L.A. at the Melrose Improv. Uncle Scott also got to enjoy more time with Nash. Wow, L.A. is turning into a second home for Nash and me. We are quite fortunate for Steve to be so gracious letting us stay with him so many times and for weeks at a time. We ended this trip to L.A. with a Memorial Day weekend pool party, where Nash got to swim in a pool for the first time since he was with me. He was in heaven in the pool, and of course the most popular guy at the party. Every woman in a bikini had to pet the Nash and he would return the affection with a lick. Guide Dogs get to have all the fun. The summer was spent in NYC, and what a brutally hot summer it was. The month’s of June, July, and August were not pleasant for Nash or me. I think 2011 is the year I will have to buy a portable AC, as the AC in my building is a joke, and I can’t go through last summer again. We did get a lot of work done these months, as we finalized Dec. 17th for LFS South Beach at the Ritz-Carlton, and we began booking LFS NYC and L.A. 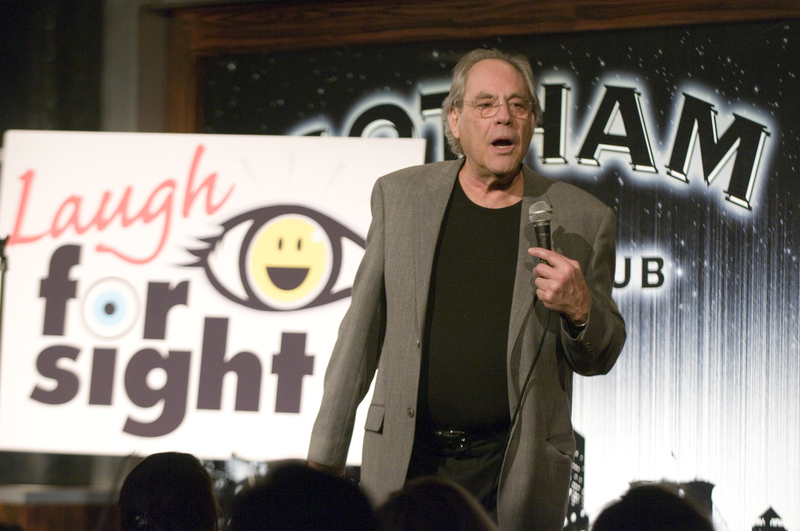 It was during these month’s that we booked Robert Klein to return for his fourth performance at LFS 5 at Gotham on Sept. 20th. We also confirmed Dave Attell, who I went to go talk to in person at the Comedy Cellar, Jim Gaffigan who we got to confirm in late August, John Oliver from The Daily Show, Jessica Kirson, Todd Barry who is now a two time performer at LFS, and after doing a show at Gotham, and seeing the amazing work of Ophira Eisenberg as host, we had to have her. 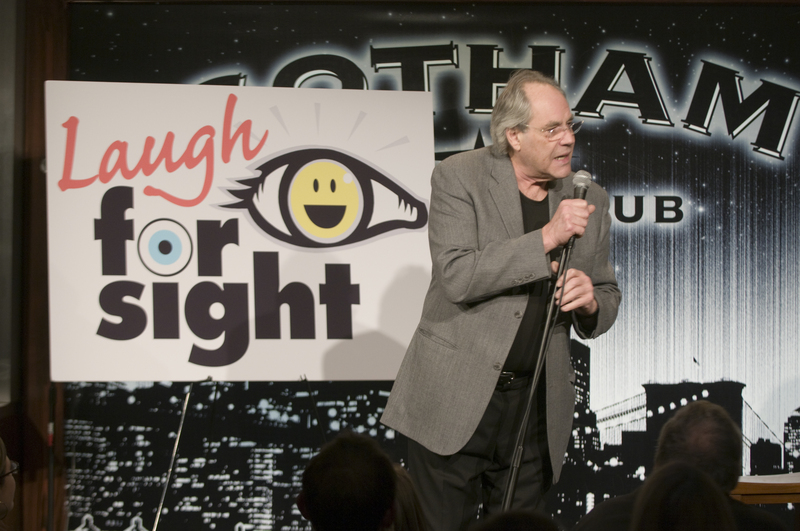 Wow, what a lineup we had put together for Laugh For Sight 5. In August, we also booked our first comedian for the inaugural LFS L.A. at the Melrose Improv, Alonzo Bodden was the first comedian to come on board. In late August, Nash and I headed out to Guiding Eyes For the Blind and spoke to members of the Lions Club to give them some insight to what life with a guide dog is like. Nash enjoyed his time back at Guiding Eyes, got a bath, and I am sure chatted it up with some of the dogs in the kennel to fill them in on all of his adventures and travels. 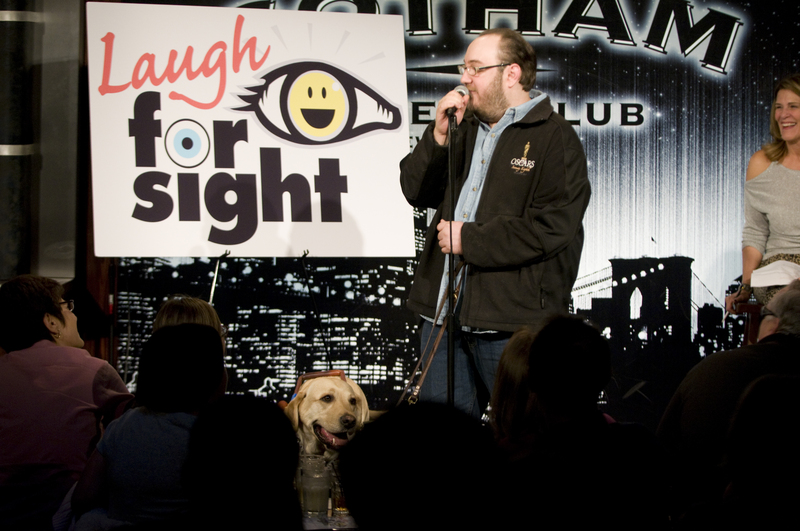 September came, and Nash and I appeared on NBC’s Saturday Today in New York, Laugh For Sight 5,was then here, and thanks to the hard work of Lis Perry, Scott Wartham, VisionZone, Mark Farrell, Guiding Eyes For the Blind, and several others, it was a smashing success. Along with the amazing lineup, this year’s silent auction was huge with donations from Comedy Central, The Daily Show, The Colbert Report, The Ritz-Carlton, South Beach, La Costa Resort, Jummy Fallon Show, Kramer Portraits, The NY Yankees, NY Jets, NY Rangers, NY Islanders, NY Knicks, Philadelphia Flyers, NJ Devils, NJ Nets, Susan Michel Limited, and many more. There was no rest for us after the September 20th benefit past, as we still only had Alonzo on board for the L.A. benefit, and it was only five weeks away! September did end with some good news, as veteran actor and comedian Kevin Pollak and Christopher Titus came on board for LFS L.A. Ok, now we can relax a little in October. Not so fast! We got a call in early October that I was needed back in L.A. for a day of filming the studio audience portion of our Top Gear segment. This was the now infamous segment of when I am introduced as the first Blind Top Gear Drifting Champion and then Nash had to steal the show by peeing on the top Gear logo. No, it wasn’t planned, and I was mortified at first, but with everyone in hysterics, and the cameras rolling what was I to do? Give Nash a leash correction in front of everyone or join in on the laughter. I choice the second choice, which I thought was the way to go. We were actually filming in Orange Couty, and I got to meet Buzz Aldrin while on set. It was pretty cool when I was introduced to him, and he said, “wait you’re blind and you drove!” Yup, Buzz who has been to the moon then said, “wow, that’s pretty brave!” That has to be hands down one of the greatest coolest compliments I have ever gotten. And as it ended up, meeting Buzz wouldn’t even be the highlight of the day, as when I checked my email, I found out that we had landed Sarah Silverman for the inaugural LFS L.A. Wow, what a day. 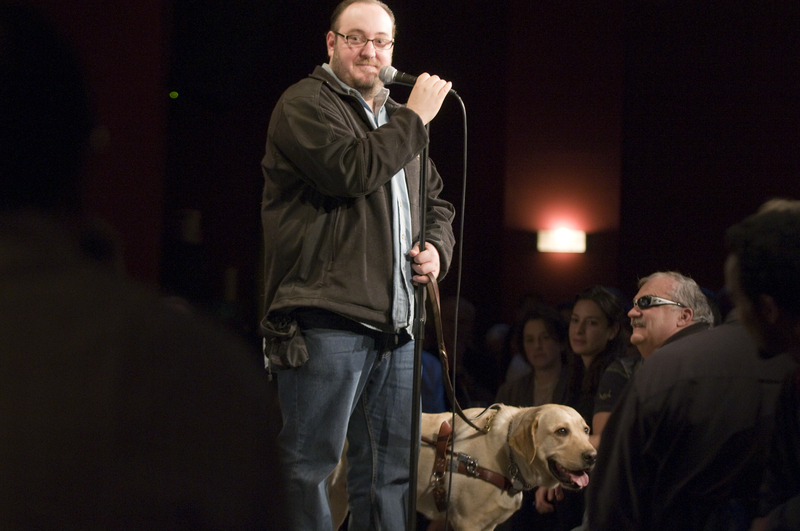 After a day of filming, we had to fly right back to NYC, as we were giving a speech at Guiding Eyes For the Blind. This time we were speaking to all the amazing puppy raisers, and as an added bonus, Lorraine Chadwick, Nash’s trainer was on hand, so Nash got to spend some time with her which he always enjoys. Nash also got to spend some time with Susan Kroha, his trainer at Guiding Eyes. All in all, a great day for Nash and me. Oh yeah, and Susan gave Nash a bath. The following week, it was off to South Beach for Ability Explosion. I had never really liked South Beach, but had a blast, and the show went very well. Nash and I then headed North to Lake Worth, and some time with my parents. After enjoying a few days there, we headed back out to L.A. and had two weeks to prepare for the inaugural Laugh For Sight L.A. We were back at Nash’s home away from home, Uncle Steve’s. Scott and I were banging the phones very hard, as L.A. is such a different animal than NYC. It was during the end of October and the beginning of November we got the great news that Adam Ferrara, Daryl Wright, and Kevin Nealon were all on board for LFS L.A. We almost had to many amazing comedians for the show. Budd Friedman also agreed to handle a live auction for us. Wow, we accomplished what a lot of people told us we wouldn’t be able to, get comedians to perform at LFS L.A. and pack the house. 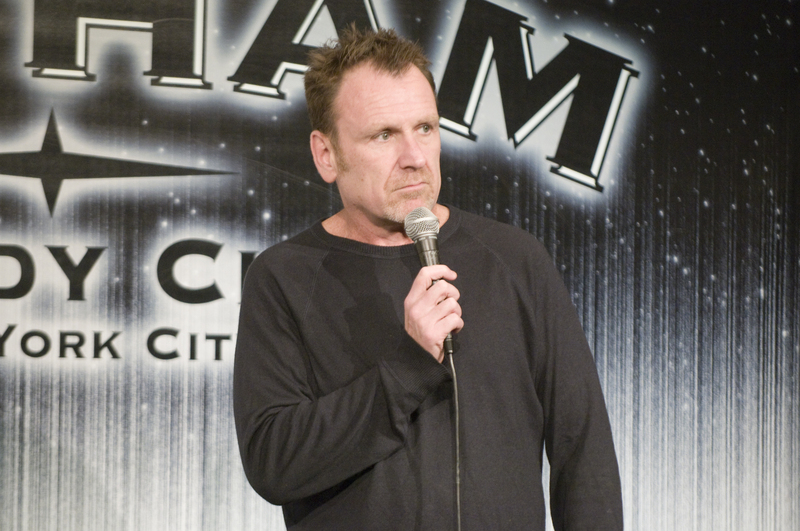 After the Nov. 9th benefit, I was told by many that this was the biggest and best comedy show L.A. had seen in years. We spent a few more days taking meetings in L.A. after the benefit and began our prep work for LFS South Beach. 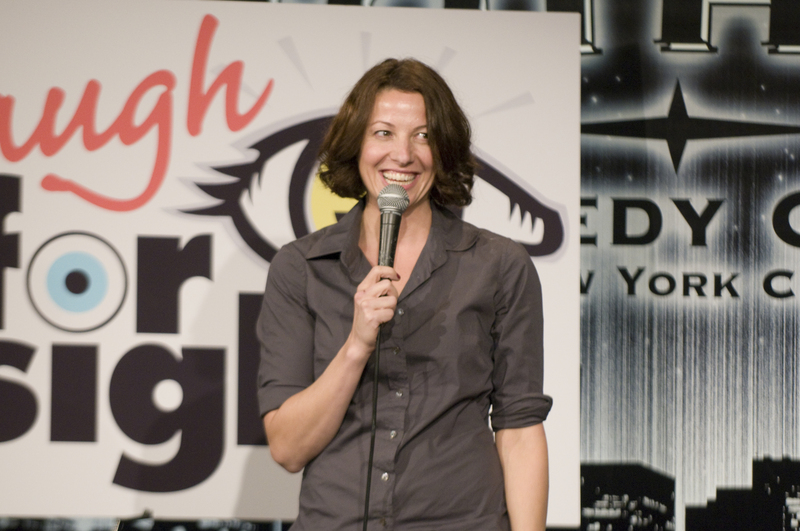 We had just gotten the amazing news that Jim Breuer would be joining Bonnie McFarlane and Rich Vos at the inaugural Laugh For Sight South Beach. Wow, what an unbelievable two month’s. We headed back to NYC in mid November and then headed out to NJ to my sister’s for a big family Thanksgiving and my niece Siena’s Birthday Party. Since she loves Elmo, I got her the Elmo chair. It was a fun hectic few days with family, but I couldn’t wait for the Sunday night of Thanksgiving Weekend, as our Top Gear episode was airing. Nash and I watched the show at home, and after receiving several phone calls and emails after friends had seen the show, I quickly learned that I would not be known as the blind comedian who drove on Top Gear, but rather the blind guy whose dog peed on the Top Gear logo! Nash was letting me know who the real star is! Finally December was here, and Nash and I were back on the road again, this time down to South Florida and to my parents. Uncle Scott flew in from California, as we were getting ready to head out on a Caribbean Cruise for a little r and r. But first, we headed over to Ft. Lauderdale, as Rich Vos who would be performing at Laugh For Sight South Beach was in town doing some shows. We went over to see him to discuss some things, and ended up opening for him at the new National Lampoon’s in Lauderdale. It was a great show, and we had a lot of fun relazing at the parents, and then set out to sea. This would be Nash’s first time out of the country as we went to Costa Maya, Belize, Cozumel, and Grand Cayman. Unfortunately, we had received some incorrect info, and Nash was only allowed off the ship in Costa Maya. Nash really enjoyed his time at sea, and was of course the most popular guy on the ship. I think 70 percent of the ship had to pet him. It did get a little old at times. It was while we were on the ship that we got some disappointing news that Jim Breuer had to bow out of LFS South Beach due to family reasons. Oh boy, now we had to bang the phones and internet from the cruise ship, and we did run up quite a bill. Not a lot of fun. We still did have a blast at sea, but next time we go on a cruise, we will not have anything coming up the following week or two. We got back in to port and had to run to my parents house as we were doing an interview with CBS 12 Miami to promote Laugh For Sight South Beach. We got lucky as we replaced Jim Breuer with Bret Ernst who was in South Florida from L.A. for the holidays. We then did interviews on NBC’s Today in South Florida, and our other comedians appeared on ABC and radio, and before we knew it, LFS South Beach at The Ritz-Carlton, South Beach was here and gone. Whew three Laugh For Sights in a little under three month’s. Now it was finally time to head back to NYC in late December with no plans to go anywhere and a lot to do to see if we can get Laugh For Sight to the next level in 2011. Now you can see why my blogs have been down this year, as it has been go go go. Overall, 2010 was an amazing year. Nash and I had a lot of adventures and travels. We couldn’t have imagined how busy of a year it would have been, so I guess not knowing what 2011 will bring could be a good thing, but it will be very tough for 2011 to top 2010, but who knows! Laugh For Sight 4 Photos! 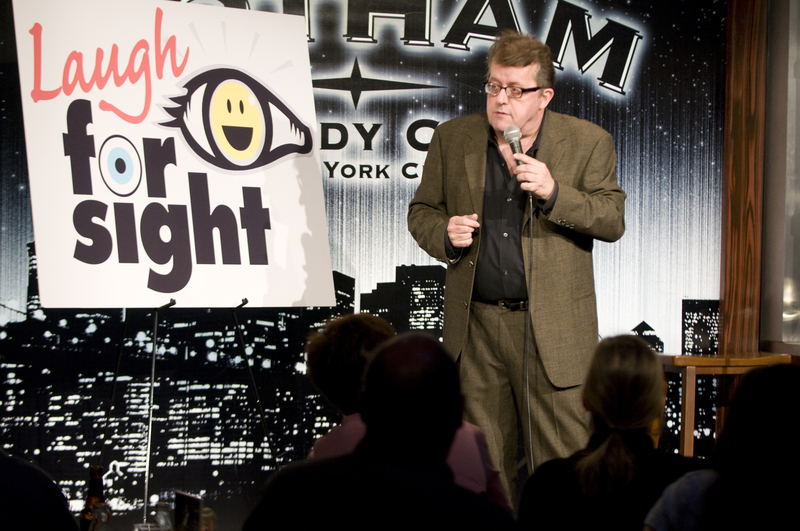 It has taken me awhile, but here are some of the photos from Laugh For Sight 4 at Gotham Comedy Club. All photos courtesy of Mark Liflander. Enjoy! Brian & Nash telling em how it is! 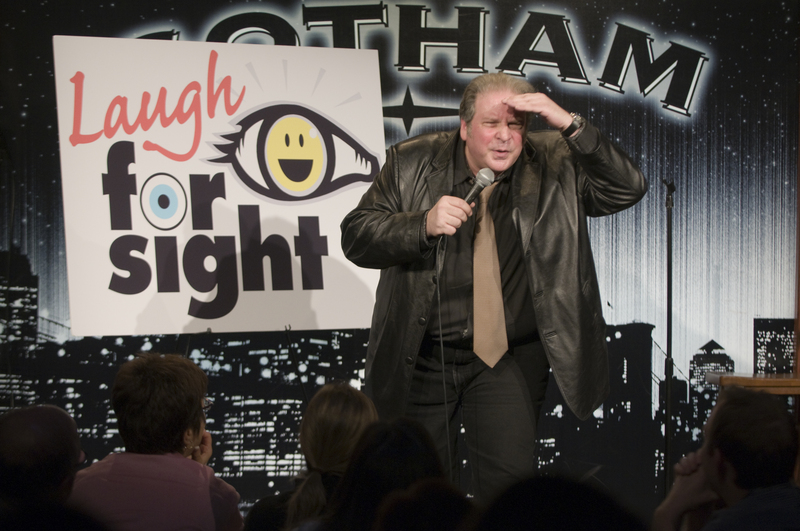 Come to Laugh For Sight 4 tonight 11/16 at Gotham Comedy Club with Colin Quinn, John Oliver, Eddie Brill, Rich Vos, Bonnie McFarlane and more!! 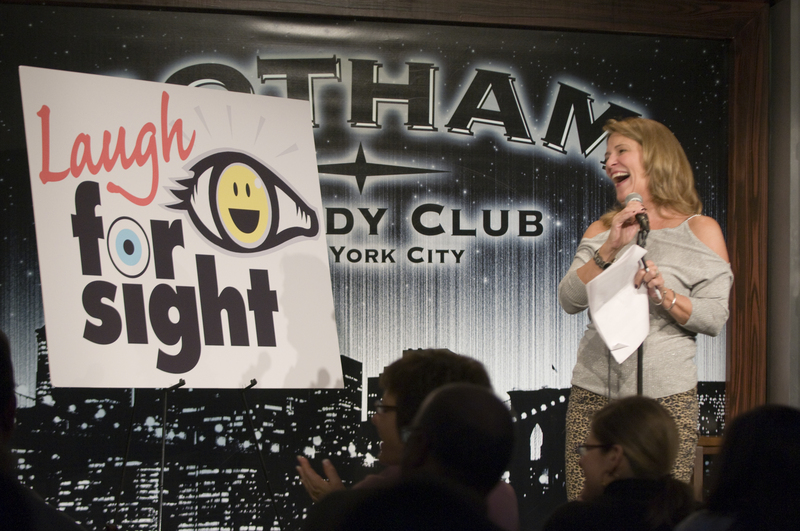 Alice Stockton-Rossini of 1010 WINS radio will emcee this year’s Laugh For Sight 4, and will be joined by some of the biggest names in comedy; Robert Klein, Colin Quinn, John Oliver of the Daily Show, Rich Vos, Eddie Brill, Bonnie McFarlane, John Morrison, and Brian Fischler and Nash. 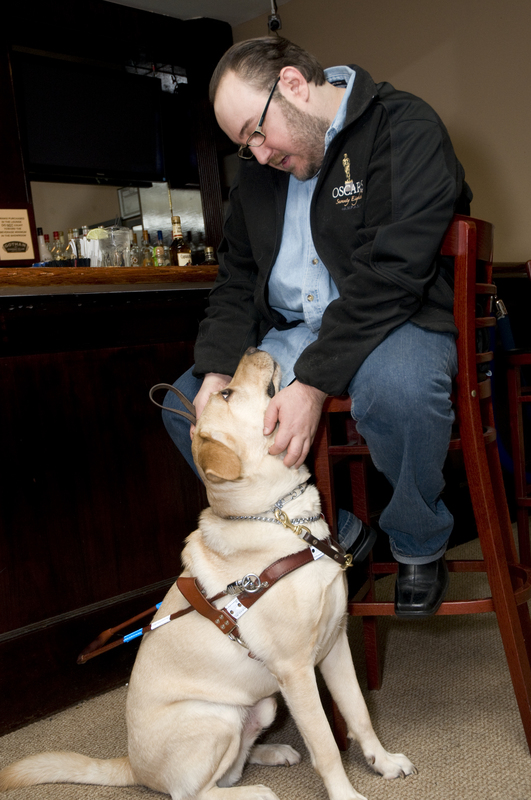 Guiding Eyes For the Blind will be greeting guests with some of their adorable puppies.! 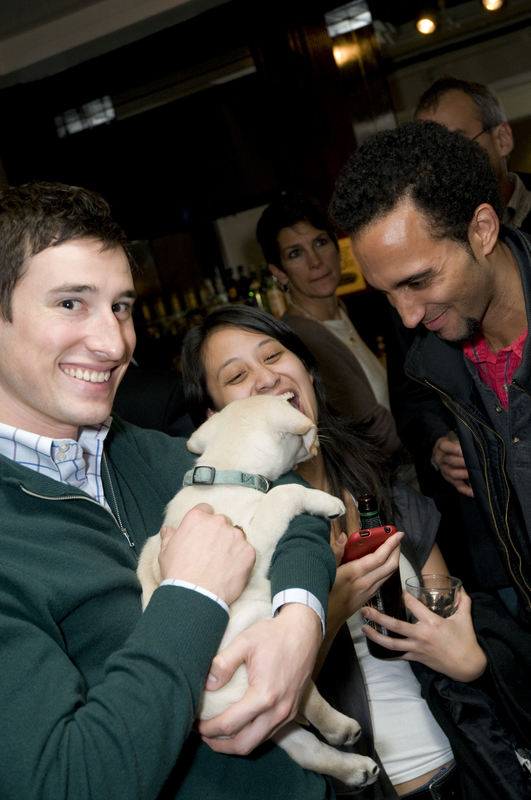 Free cocktails during the silent auction provided by Diageo, Patron, and the Brooklyn Brewery! Donors to the silent auction include Comedy Central, the Mandarin Ortiental Hotel, Eli Manning, NY Yankees, NJ Devils Tickets, “Rock of Ages” the hit Broadway Show, Second Stage, Exhale Spa, Hilton Hotels, Circle Cruise, Prada, Patron, Kramer Portraits, Robert Marc, Felix Rey, Vinyl, Grannine Cashmere, several items of fine jewlery, and much more! Proceeds will benefit Guiding Eyes For the Blind and The Scheie Eye Institute at the Univ. of Pennsylvania. 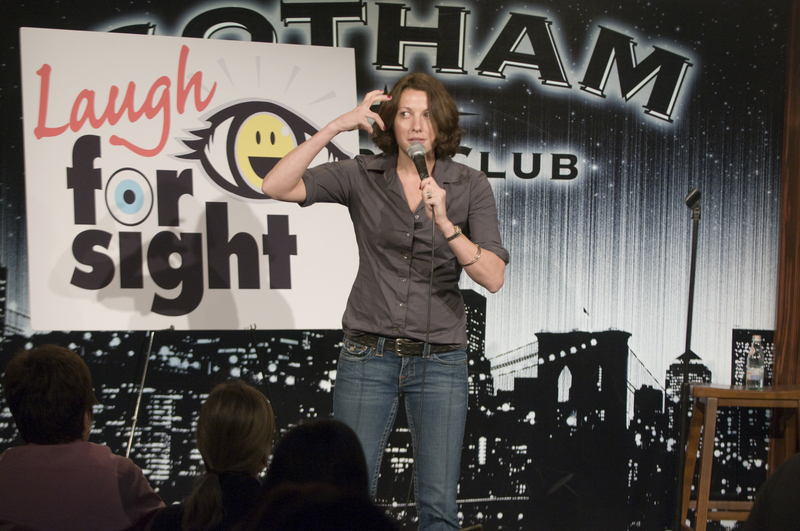 Tickets can be purchased at www.laughforsight.com, www.gothamcomedyclub.com, or by calling 212-367-9000. 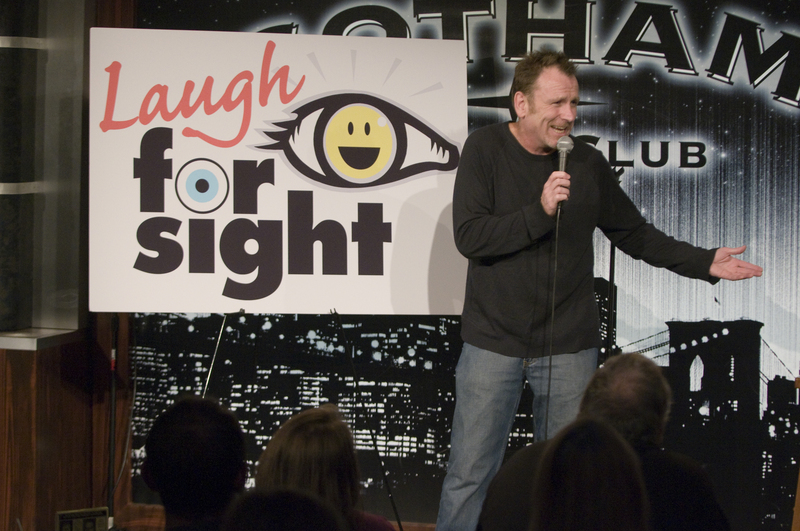 I’ve created a monster and get your Laugh For Sight 4 tickets 11/16/09! Nash sleeps in my bed one night in six month’s, and now he thinks it is his bed. Last night he got into my bed hours before I was going to sleep, it was like he was positioning himself, and saying hey buddy, first come first position. At about 9pm he got into the bed, and spread out all over the bed. He did get out of the bed later, and we played for a little, then went for his late evening walk, but as soon as we got back to the apartment, he darted back into the bed, and I know I am blind, but I could swear he had an evil smirk on his face. I was still up for a bit, and Nash was camped out in my bed. Finally I was ready to go to bed, and as usual, I was afraid to look at the clock, because if I don’t know what time it is, then I am really not up that late. I had to put my comferter back on my bed, and I flung it all over the bed, and over Nash, and he didn’t budge. I decided to sit on the couch, and watch a little more tv, and Nash just camped out underneath the blankie. It was like he was in a cool little fort, or camping out in a tent. Finally, I wanted to get into bed, and I didn’t want Nash to get all fidgety while I was asleep so I got him to come out from underneath the blanket, and he repositioned himself on top of it. He was kind enough to move over when I got into bed, but then he started running all around me, and was standing over me, and I’m like, sorry dude this isn’t going to work. He was then standing on my right, and was standing on the cliff of the bed, and I’m trying to tell him to go to the other side. I even tried picking him up to move him to my left with no luck. Eventually, he understood, and crashed out on top of me a little on my left. I thought when I got a guide dog that I would tell him what to do, but I think even after six month’s we are still trying to determine who the boss is. Even though it is only three in the afternoon, I am thinking about getting into bed, hey, I got to get my spot for tongith before Nash gets his! New York City’s Pulse 87.7 will be at the benefit and handing out gifts to guests as they arrive! Donors to the silent auction include Comedy Central, the Mandarin Ortiental Hotel, Eli Manning, Hilton Hotels, Circle Cruise, Prada, Patron, Kramer Portraits, Robert Marc, Felix Rey, NJ Devils tickets, Second Stage, Broadway Show “Rock of Ages”, Dramatics NYC, Grannine Cashmere, several items of fine jewlery, and much more! Proceeds will benefit Guiding Eyes For the Blind and The Scheie Eye Institute at the Univ. of Pennsylvania. 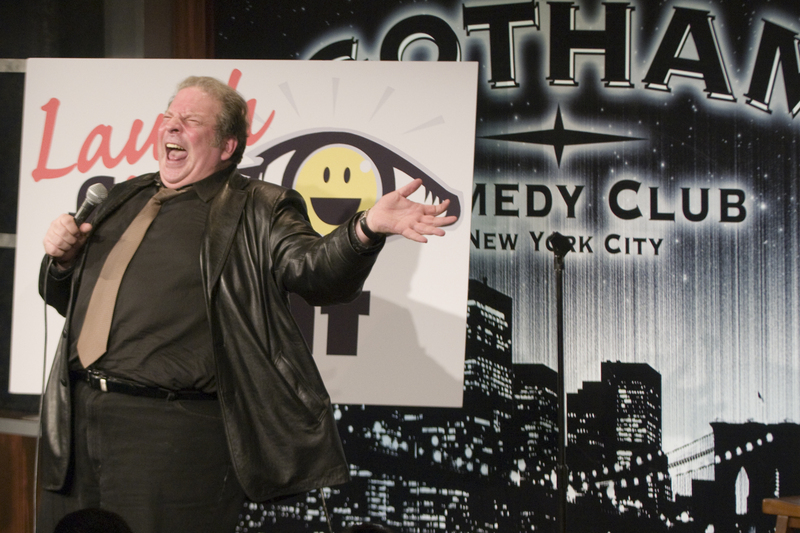 Tickets can be purchased at http://www.laughforsight.com, http://www.gothamcomedyclub.com, or by calling 212-367-9000. For more information, please visit http://www.laughforsight.com, and for questions, corporate tables, donations, or ads, please contact info@laughforsight.com.